Many administrators of smaller companies would like to avoid the expense of a tape library and are looking for a rapid and up-to- date alternative. 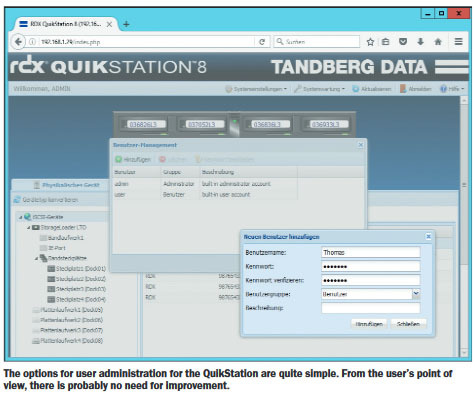 These prospective customers may find what they’re looking for in the RDX QuikStation from Tandberg Data. Tandberg Data positions its RDX QuikStation 8 as a removable disk system specifically for small to medium-sized enterprises. If you had been expecting a system with poor performance, then you will be pleasantly surprised, since the manufacturer’s design for a basic device like this is actually quite clever and flexible. The "8“ in the name refers to the number of RDX drives that the administrator can load from the front with all sizes of RDX media. With a theoretical data transfer rate of up to 3.6 TB/s and a maximum data capacity of 24 TB when using 3 TB media, the QuikStation is also suitable for replacing an existing tape drive autoloader. With iSCSI, the system is available with one 10 GbE port and up to four 1 GbE ports. With NIC bonding, load balancing, a redundant power supply and a web-based management interface, it provides much of what an administrator requires in the server room or data centre in terms of data storage, archiving, and data recovery for small to medium-sized businesses. The QuikStation is designed for rack mounting as a 19-inch 2U device, and is delivered with rails and all the necessary connecting cables. Inside the device, there is an Asus type P9DWS workstation/high-end PC board based on an Intel C226 chipset. Tandberg Data uses an Intel type 4160 Core i3 for its CPU, with a clock speed of 3.6 GHz and 3 MB of level 3 cache provided for 16 GB of memory. The device doesn’t use a classic hard drive; internally, it provides the operating system with a King Spec 8 GB solid state drive through a SATA interface. In addition to the on/off switch, the front panel has eight RDX slots, each of which has an eject button. On the back, you will find a typical small server rear panel, with USB 2.0 and 3.0, VGA and PS/2 ports, as well as a single power supply or redundant power supply and up to five network interfaces. The onboard NIC remains permanently disabled. A connection to the out side can be made with a 4 gigabit interface or optional 10 gigabit interface. Setup is really quite simple, but old-fashioned: install the device in the rack, connect a network cable, read the IP address provided by DHCP server from a VGA display and proceed with configuration via the web interface. If you do not have a VGA adapter to hand, you can also insert a USB stick with an empty text file named network.info when powering on; the operating system will then write the IP address to that file. In cases where you are not running a DHCP server, this method can be used to assign an IP address to the Quikstation. Unfortunately, in our test, the VGA display did not display any usable IP value at all, and we had to determine the address via the DHCP server itself. This small issue was the QuikStation’s only glitch throughout the entire test. However, we’re not quite sure why there is no software that administrators can use to discover Tandberg devices on the network. The administrator performs all the configuration via the web interface, which is presented simply and clearly. User management provides only three fixed roles: "User“ with read only access, "Manager“ with the ability to also access iSCSI and connection data, and "Administrator“ who has the ability to change system configuration, perform firmware updates, change the logical drives, and format and copy RDX cartridges. All users must be members of one group; there is no relationship between drives and users. Accessed via the network, the eight drives are initially presented as eight completely independent RDX targets. After configuration, the QuikStation can be switched into one of the possible modes. In the simplest case, the administrator accesses the individual drives via iSCSI as either removable storage or a hard disk. Another mode allows the QuikStation to act as two logical media which two host systems with up to four RDX drives address as two disks. Alternatively, the QuikStation can become a single large combination unit that presents up to eight RDX drives to a host as one logical drive. These modes allow the station to be used extremely flexibly, because the primary assignment is done from the host system. However, for backup scenarios with established programs, the emulated mode variants are exciting: one Storage Loader with eight slots and one LTO3 drive, one emulated T24 storage library operation with eight slots and two virtual LTO3 drives or one emulated hard disk autoloader with eight slots in a single drive. The combination mode with one emulated LTO autoloader and four independent RDX targets is another way of presenting the drives. The QuikStation must be rebooted after any extensive system configuration changes such as changing an IP address or the operating mode. Fortunately, it is usually only necessary to make this basic operational setting once. For the LANline test, we selected a mixed subdivision into four RDX drives in LTO emulation and four separate RDX targets. 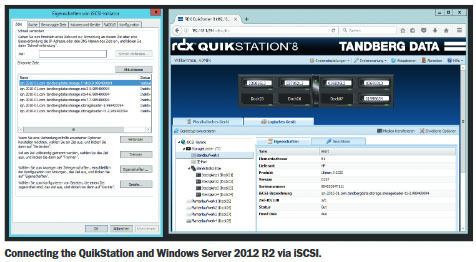 In the test, the QuikStation was used, together with the current backup software from Veeam (Availability Suite version 9.0.0.9), on a physical Windows 2012 R2 server on Dell T310 hardware. We had no trouble connecting the single iSCSI fixed disk devices or the emulated LTO loader. Veeam usually operates in “incremental forever” mode and uses the QuikStation as removable storage in the repository, and then does a backup to the RDX tapes in LTO mode. 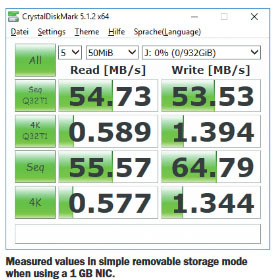 When using a conventional gigabit NIC, one RDX drive as an iSCSI device on a Windows 10 computer achieves sequential write performance of approximately 52.45 to 63.33 MB/s in Crystal Disk Mark 5.1.2. Read performance is a little lower than this at 54.42 to 55.15 MB/s. The values measured are largely stable regardless of the size of the test files. The same 750 GB cartridge, inserted into a local USB 2.0 RDX drive, achieved significantly lower results on the same test machine, with read/write performance of approximately 23 MB/s. 1 TB media from the current generation achieved roughly comparable results in iSCSI operating mode, but its write performance was better at just under 65 MB/s. At least in our test, the actual backup speeds that were achieved with two simultaneous backup streams in single gigabit mode (such as would occur in most small and medium-sized enterprises) were 25 MB/s. When a bottleneck occurred during backup, the Veeam solution sometimes indicated that the source could not provide the data quickly enough. The virtual machines that were to be backed up from a VMware vSphere environment with one ESX host and one VM from a Hyper-V installation probably did not perform fast enough to keep up with the backup solution. In a second scenario, in order to push the media to their performance limits, we used the 10 GB connection of a 64-bit Windows 10 system in a T3500 Dell Precision workstation, and achieved extremely good performance. The write performance doubled in removable storage mode and increased another ten percent when Windows addressed the iSCSI target in “fixed mode” as a conventional hard drive. In its maximum variant, with eight RDX drives in hard drive mode combined into a single large RAID 0 striping device, the benchmark read performance increased to 741.7 MB/s and write performance increased to just under 800 MB/s. Small firms in particular will benefit from the good performance, the simple design and the robustness of RDX technology. Unlike Iomega’s similarly designed REV format, which disappeared very quickly from the market, Tandberg Data has succeeded in reliably offering RDX technology over the long term. According to the manufacturer, over 2.9 million cartridges have been shipped to date, and they have some strong partners onboard in the form of Dell, HP, Lenovo, Fujitsu, Maxell, Quantum and Hitachi. In terms of future-proofing, RDX has repeatedly stood out over the years because the manufacturer could always guarantee forward and backward compatibility of their drives. The current roadmap envisions some improvements for the QuikStation devices: better performance, “active cloning” of cartridges, full support for IPv6 and auto-mounting. The last feature in particular needs some explanation: To date, there has been a handicap in implementing media rotation, because in the version thatwe tested, the user must confirm insertion of media in the QuikStation’s web interface. Because this web interface is actually only operated by IT personnel, switching media must always be confirmed by an administrator. In the future release, the QuikStation will automatically recognise any media already been assigned to it, and can mount them accordingly. The sequence in which media are inserted is irrelevant; the user simply cannot insert previously unknown media. Excellent product choice! The QuikStation 8 is a deluxe version of an RDX drive and provides adequate space for data with a total gross capacity of 32 TB. If, in future, media over 4 TB per cartridge were needed, its value will also increase, which is of practical use to the user. The administrator can integrate the station extremely flexibly into their backup strategy and reliably achieve good performance.